Two C grades in four months equals a problem in the eyes of the Health District. But in tonight's Dirty Dining, a restaurant tells Darcy Spears the inspection process is the problem and they're just doing their best to survive. LAS VEGAS (KTNV) — Two C grades in four months equals a problem in the eyes of the Health District. But in tonight's Dirty Dining, a restaurant tells Darcy Spears the inspection process is the problem and they're just doing their best to survive. Something became immediately clear when we walked in to Playa Papagayos Seafood Restaurant on Sahara and Decatur. “I'm looking for the grade card. I see a bunch of stuff on the wall. But I don't see that,” says Darcy. Playa Papagayos got a 37-demerit C grade on January 2, but doesn't seem too eager to display it. “Is that your C grade kind of hidden down there?” asks Darcy. “Uh,” says the person in charge, Mayra Morales. “Looks like it,” says Darcy. We asked direct questions, but got indirect answers. “They came at a busy moment and we're just kind of, you know, getting things--like I said we're understaffed at the moment so we just, you know, but, um,” says Mayra. But she says they're not excuses, just reality. “Do you feel that they're a little too nitpicky?” asks Darcy. “They are, but you know what? If that's how they want it, that's fine with us. We just, you know, in the moment when we're busy, as long as we're getting our food how it has to be, we're fine,” says Mayra. 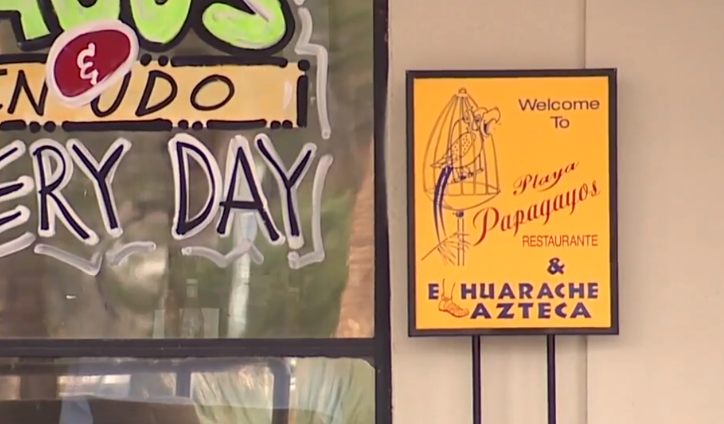 Inspectors were not fine with much of the food at Playa Papagayos. Bread was expired. Pots of menudo, posole and red beef stew had to be thrown out due to unsafe temperatures. So did beans, salsa, shredded lettuce and carne asada. A large pot of brown stew in the walk-in fridge was stored on the floor and ceviche, salsa, pork, roasted tomatoes, soup and rice were uncovered and unprotected from contamination. “I just want to make sure--or have it clear--that we are a very clean establishment, you know, where it counts. The food--everything is fresh, everything is clean, as clean as we can have it definitely,” says Mayra. Not according to the Health District. Inspectors called this spatula unsanitary and in disrepair. The citrus juicer was dirty and stained. Soda nozzles and strainers were soiled and the meat and tomato slicer was dirty with food debris. There was also no hot water in restrooms. “So you disagree with some of the violations that they wrote up?” asks Darcy. “We do, but, I mean, there's people that are very sensitive, I guess, so.” says Mayra. “The regulations are what they are,” says Darcy. “Yeah, there's nothing we can do about it so we'll just, you know,” says Mayra. Inspectors documented conditions inviting to pests including food debris and grease build-up on stove shelving, in between stoves and in floor drains. The refrigerator doors were also soiled with food debris. And, they said the person in charge was not knowledgeable about food safety. The Health Report ends with this note, saying "due to history of noncompliance with food safety regulations, facility is mandated to receive intervention training. “There's definitely places out there that are way worse. They just happened to catch us on a bad day so it's understandable and, you know, hopefully no one stops coming here because of that,” says Mayra. Playa Papagayos still has a C grade. They told me they've scheduled reinspection for the end of this week. Darcy Spears, 13 Action News.